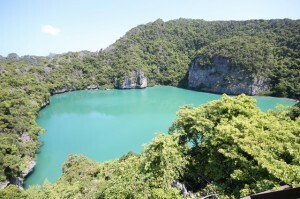 The Ang Thong National Marine Park consists of 42 islands belonging to the Ang Thong archipelago. It is located in the Gulf of Thailand, about 35km west of Koh Samui and Koh Phangan and about 40km south of Koh Tao. The Islands belongs to the Samui District of Surat Thani. Most of these Islands have their own beaches, which are often made of fine white sand. Some islands have beautiful shallow-water coral reefs. The islands themselves are made of towering limestone cliffs of exceptional beauty similar to those of the Phang Nga Bay to the west of Thailand. Only this national park is less well known, and therefore less overcrowded. The National Park covers an area of 102 square kilometers. 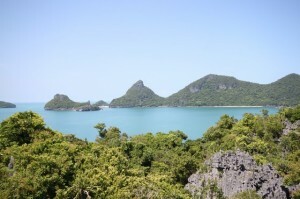 The Islands of An Thong were declared a national park when the Thai Navy planned to build a base in the area for the protection of the Gulf of Thailand. Since 1972 the Islands were declared a national park. On the 12th November 1980 it was issued from the royals that the An Thong Islands and another 21 Islands which was in the zone of 102 km2 around the Islands were declared as a national park. The National Park consists of 42 islands that are formed mainly of limestone hills and steep cliffs. These extend up to 396 m above mean sea level. The largest islands are Wuatalab, Mae Koh, Samsao, and Tai Hindub Plao. The largest part of the national park is water and forest, which accounts for around 20% of the area. There are very few really large trees because the soil is rather thin. The forests in this park can be classified as a dry evergreen forest, beach forest and limestone forest. Dry evergreen forests are found especially on the larger islands such as Wuatalab, and Paluay Samsao. Larger animals are hardly on these islands because they are relatively small and they are dominated by steep limestone cliffs. You can see around 16 species of mammals such as otters, langurs, crab-ness monkeys, wild boars, silver hair, bats, dolphins and whales. Other residents are at least 54 species of birds and small heron, common sandpiper and hornbills. 14 reptile species are endemic, including ground lizards, iguanas, green sea turtles, pythons and Cobras. Amphibians are only 5 types, namely: The common Asian toad, tiger frog, frogs and tree frogs. The waters of this national park are home to butterfly fish, angel fish, parrot, black-tip reef sharks, groupers, jacks, sea cucumbers, blue crabs, clams and oysters. The climate is similar to the rest of the western Gulf. From May to October, SW monsoon season, from November to April NE-monsoon. The period of fine weather in this area is approximately 10 months. The heavy rains and bad weather is every year around November, but this can happen even in the second half of October or draws in other years up to the half of December. At that time, it may happen that most transport, power boats, and long tail cannot get access to the Islands because of the heavy seas. There are many speed boat tours to the Islands and a selection of other larger tour boats which include kayak tours as well as snorkeling. When renting a villa with us we can organize the trip by either private speed boat or larger vessels to the Ang Thong National Marine Park.